Finally a swine syringe enabling 2 vaccines in 2 different dosages at 1 shot. 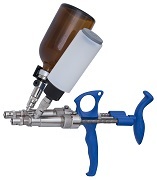 ThaMa 253 automatic all metal double swine syringe combines two syringes in one vaccination device. Its unique fixed dosage technology makes it possible for the syringe user to administer two different vaccines of two different dosages at once. 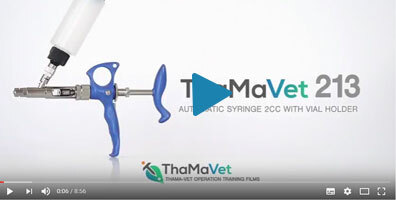 The ThaMa 253 swine syringe comes with a unique 2-to-1 bridge that offers the option of using one or two needles, when needed. In addition it’s equipped with a vial holder which enable the option of attaching the vaccine bottle directly to the syringe. 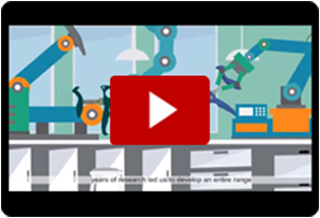 Designed for the swine industry, it it has been purposed to work with tough and granular vaccines. Each syringe features three interchangeable pistons that range of 0.5cc, 1.0cc and 2.0cc.